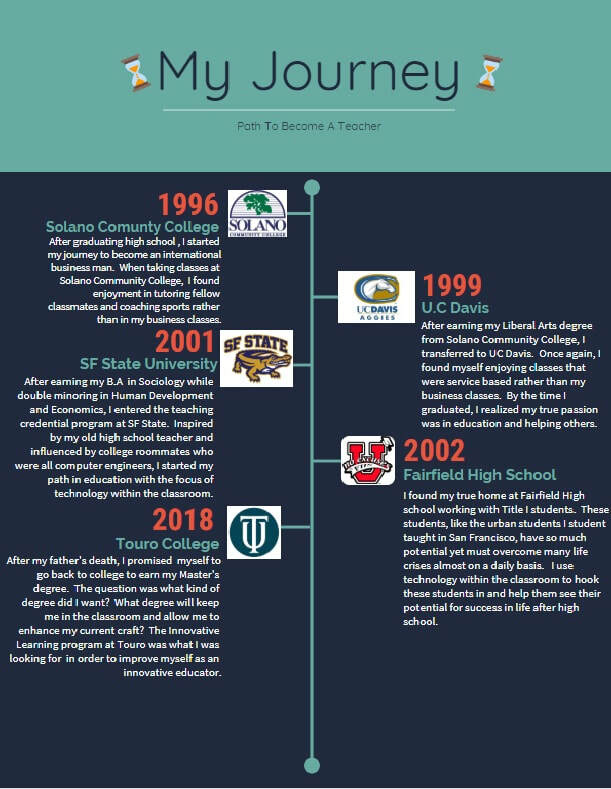 ​​When I joined the Innovative Program and started learning how to use more technology within the classroom with more purpose in how I teach, it reinvigorated me in teaching my students. By also joining the program, it reinforced the idea I try to teach my seniors before they graduate high school. The idea that it will take a village to be heard and not one person alone. Just like in our society, strength is in numbers and not alone. "The needs of the many outweighs the needs of the few or the one," said by Spock. If I want to make everlasting change with my students I must also teach others like me, teachers like me, and innovators like me to influence our students to be successful in the 21st century. The Learning Innovative program gave me a waterfall of information to use within my classroom, not just to challenge my students preparing them for the 21st century, but challenging me too as an educator. One of the main ideas I took out of this program is that teaching is design and purposeful thinking. To prepare our students for the demands of the future, we as teachers must have lesson plans with purposeful design to achieve those goals. To achieve those goals, we educators must prepare our students to be able to use technology to compete in our ever changing world. One way to achieve these goals is that we as teachers must think outside of the educational box and use more of our right side of our brains. By using more of our right side of the brain we can create more unique and engaging lessons for our students and teach them how to be creative and unique themselves. I learned a lot from the Innovative Learning program from new technology that can enhance teaching in the classroom to a new paradigm of thinking in education on how to better serve our students. This is why I am always striving to learn more and keep up with the "Jones", is to be a better teacher and mentor for my students now and my student to come. ​Fill out form below and tell me your thoughts.